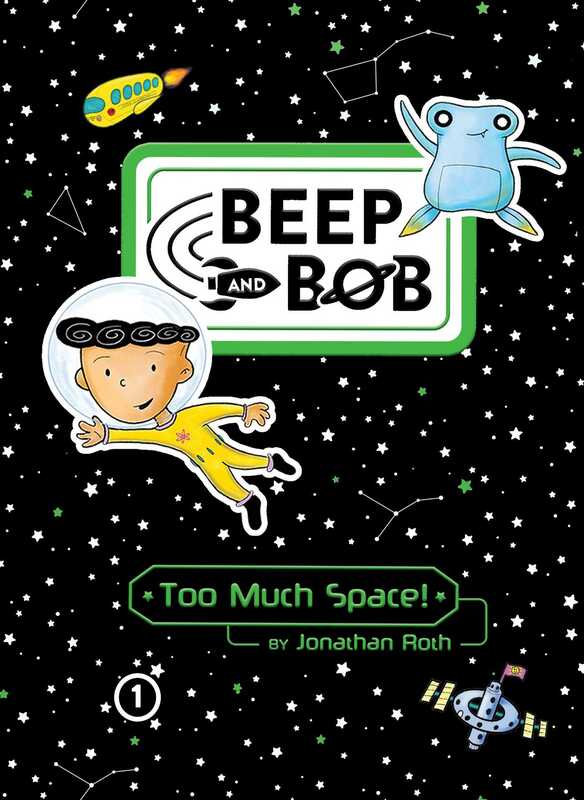 Meet space-school attendee Bob and his alien bestie Beep in this start to an outrageously funny and action-packed chapter book series that’s great for “kids who love funny stories but may be too young for books like ­Diary of a Wimpy Kid” (School Library Journal) from debut author Jonathan Roth! Astro Elementary is a school near Saturn attended by the bravest, brightest, most elite kids in the galaxy…and Bob. Bob never wanted to go to fourth grade in dark, dangerous space. He even tried to fail the admissions test by bubbling in “C” for every answer—and turned out to be the only kid on Earth to get a perfect score! Bob feels he couldn’t be more misplaced at his school—until he meets Beep. Beep is an alien from the planet Orth who was kicked off his home world for being too small. The instant Bob finds him, Beep adopts Bob as his new mother. Soon Bob can’t turn around without bumping into Beep’s squishy little body. Together, they make the perfect team. And Bob logs their adventures on his space blog, or SPLOG, with Beep providing the illustrations. In their first adventure, Bob is humiliated on a field trip to Pluto when his tongue gets stuck to the ice. Not even Beep can keep Bob from becoming the laughing stock of the school. Bob has to find a way to completely change his personality, just in time for their next treacherous field trip—to the gaping mouth of a super massive black hole! SPACE IS THE MOST TERRIFYING PLACE EVER! If you’ve been to space, you know what I mean: It’s dark, cold, airless—and it goes on for infinity! Okay, maybe it ends at some super huge wall. But what’s behind that wall? More space? Bigger walls? Giant space spiders?! Just kidding about that last one. There are no spiders in space. Beep just said to say hi. Beep is a young alien who got separated from his 600 siblings when they were playing hide-and-seek in some asteroid field. Then he floated around the void for a while, until he ended up here. Sad, huh? You know what’s even sadder? I was the one who found him knocking on our space station’s air lock door and let him in. Now he thinks I’m his new mother! On the bright side, everyone at school says Beep is super cute and fun to have around. And since he won’t leave my side, they let him join my class as the school’s first alien student. He’s definitely a quick learner—he picks up languages in no time, and his grades are already better than mine! Anyway, I’m writing these space logs (or splogs, as we call them) partly to tell you all about my hectic life, but mostly because it’s an assignment to show you how “great” things are here in the future. At the end of each week I’ll put all my entries into a time-velope and mail it to 200 years ago. If you receive this, please write back; and while you’re at it, please also include a pile of vintage twenty-first-century comic books! Thanks. Beep will help with the pictures. He’s super talented and loves to draw, though in his excitement he sometimes eats all his pencils. Author-illustrator Jonathan Roth is a public elementary school art teacher in Maryland who likes reading, writing, drawing, cycling, and napping. Though he has never left the Earth, he has met four of the astronauts who have gone to the moon. Beep and Bob is his first series. Pretty sporky, as Bob would approvingly put it. A strong addition to any library's chapter book selection. Book Cover Image (jpg): Too Much Space!